Cleveland Indians pitcher Corey Kluber turned in a dominant performance Saturday night, hurling a complete game against the Chicago White Sox. Kluber registered eight strikeouts without issuing a walk, and allowed one unearned run on five hits. 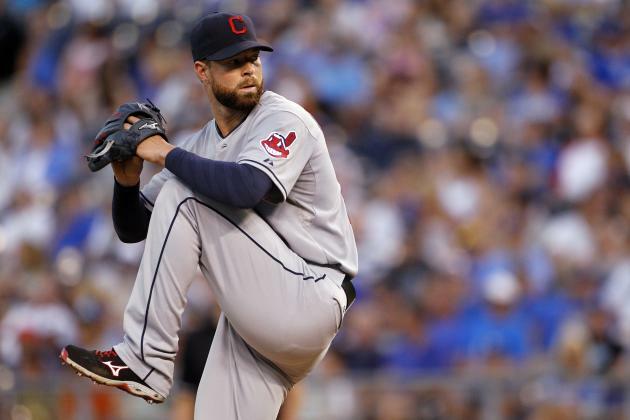 It was the latest in a string of dominant performance for Kluber, who has posted a 1.49 ERA in the second half, with a 28.6 percent strikeout rate. While Seattle Mariners ace Felix Hernandez has seemed to have a death grip on the Cy Young award, Kluber is a legitimate challenger. Hernandez has struggled as of late, and with Saturday’s performance, Kluber now has 5.7 fWAR, which leads AL pitchers. Of course, that’s not the end of the story, and Hernandez’ ERA is nearly three-tenths of a run lower. Cleveland’s big right-hander is having a fantastic season. However, this shouldn’t be totally unexpected. The 28 year-old showcased some very impressive stuff in 24 starts in 2013. While his 3.85 ERA didn’t stand out, he had excellent strikeout and walk rates of 224. percent and 5.4 percent, respectively. This year, Kluber has improved on those numbers. This season Kluber has increased his strikeout rate to 27.0 percent, while maintaining a low walk rate of 5.6 percent. He’s also boosted his ground ball rate to 48.9 percent. His park-adjusted xFIP of 72 is tied with David Price for the second-best mark in the AL, and is just four points behind Hernandez. Last year home runs and hits on balls in play were Kluber’s achilles heel. Slightly over 12 percent of the fly balls Kluber allowed left the yard, and opponents hit .329 on balls in play. Pitchers generally have less control over these aspects of the game than strikeout, walk and ground ball rates. This year, only eight percent of fly balls have left the yard against Kluber, and opponents are hitting .307 on balls in play. 2014 has been a phenomenal season for Kluber, who has relied heavily on his slider. The pitch has quickly become one of the best offerings in the major leagues. It’s had almost equal effectiveness against left-handed and right-handed pitchers. Along with his curveball and changeup, which he uses seldomly, Kluber has three offerings with a swinging strike rate of at least 19 percent. The Indians found a diamond in the rough in Kluber, who was originally drafted by the San Diego Padres in the 4th round back in 2007. They acquired him in 2010 as part of a three-team trade in which they gave up veteran Jake Westbrook, who would have one more solid big league season before retiring this year. With the Indians Kluber has blossomed into a legitimate ace. Hernandez is still the favorite for the AL Cy Young award, but Corey Kluber is just as deserving. The last few starts for each could be the difference. Either way, it’s been a great year for the right-hander who didn’t even make the All-Star team.